In the wild wastes of the Northern Marks, an evil is gathering. Raging storms flood the rivers, and black clouds darken the daylight hours. 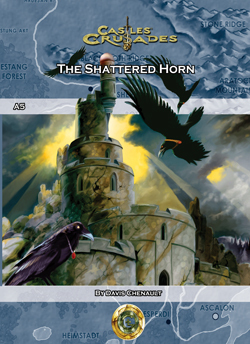 Ravens and bats have gathered in great hordes near an ancient fortress long abandoned. Travel to this place is perilous, and the guardians of the Northern Marks are spread too thin to make the trip. They seek the aid of powerful champions to brave their way north and uncover the happenings here. Traveling through the tangled escarpments and rugged hills of the Blighted Screed is dangerous work, but little compared the creatures and evil lurking in the burned out husk of the fortress of Festung Akt. In the deep halls beneath the ancient keep is an evil so great as to gather the storms of winter and call forth the Speakers of the Dead, the Ravens of the Blasted Heath. Stopping the coming storm will be trying to even the most stalwart of heart. From the makers of the Castles & Crusades roleplaying game comes the fifth adventure for your champions to discover the intentions of a cabal of wicked priests.